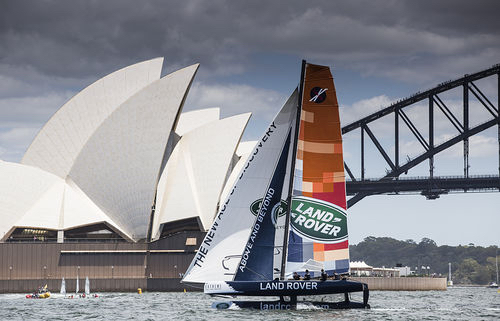 The 2015 Extreme Sailing Series will come to a crescendo next week against the stunning backdrop of Sydney Harbour, as a full grid of nine top international Extreme 40 teams compete for the ultimate accolade of the 2015 Series title. 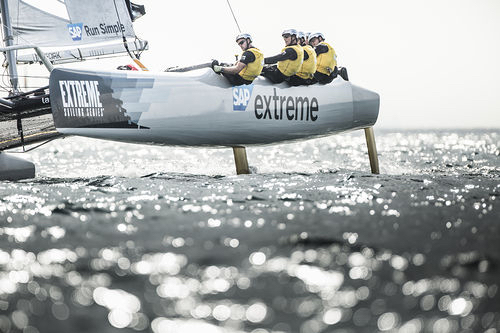 Going into the final Act of the season with a healthy 11-point lead over nearest rivals SAP Extreme Sailing Team, all eyes will be on The Wave, Muscat’s skipper Leigh McMillan and his crew including recently crowned ISAF World Sailor of the Year, Sarah Ayton. With five Act wins under his belt so far this season and two Extreme Sailing Series championship trophies already on the mantelpiece, McMillan is on the verge of making Series history as the most successful Extreme 40 helm of all time. But with the Extreme Sailing Series Act 8, Sydney presented by Land Rover counting for double points as the season finale, the fleet are not going to let McMillan take the title without a fight. Danish team SAP Extreme Sailing Team co-skippered by Rasmus Kostner and Jes Gram-Hansen pose the biggest threat to McMillan’s remarkable record. 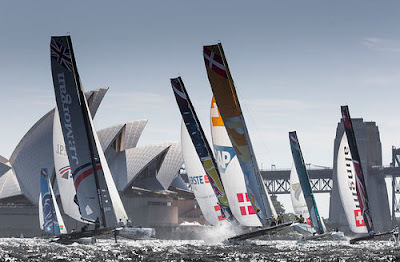 Sailing their best season to date, the Danes took a victory that made the heart sing at Act 3 Qingdao in March proving they have what it takes to takes to beat The Wave, Muscat. 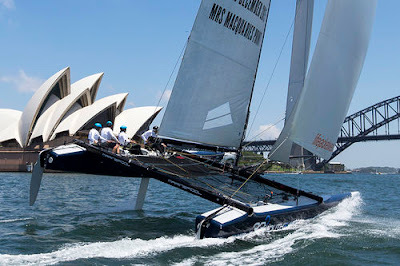 To take the Series title themselves the Danes will need to win in Sydney with The Wave, Muscat finishing seventh or below in the fleet of nine boats – no mean feat. But Kostner and Gram-Hansen will have to be careful not to get caught up in the battle for glory. 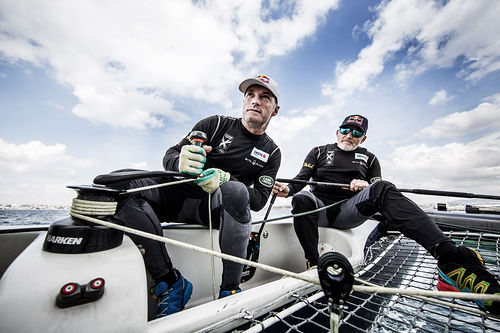 With Red Bull Sailing Team just one point adrift in third it would only take one mistake for the Danes to lose their grip on second position to the Austrian duo of Roman Hagara and Hans Peter Steinacher, who won Olympic gold on Sydney’s waters in 2000. Lower down the standings the season long battle for bragging rights between Oman Air, Gazprom Team Russia and GAC Pindar continues. Each team has found excellent form but struggled with consistency. 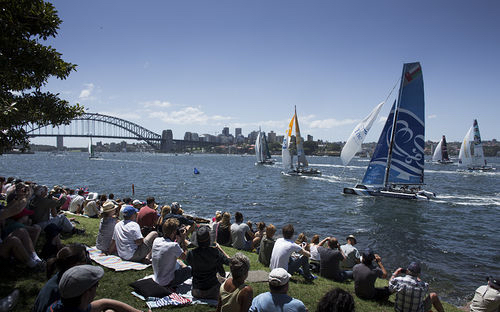 “We have had a few Acts this season where we could have been in the top three so Sydney is our last chance to move onwards and upwards and sign off the year in style,” commentated Oman Air’s British skipper Stevie Morrison. Rounding up the fleet in Sydney will be Lino Sonego Team Italia with French Extreme 40 veteran Pierre Pennec on the helm, Team Turx with Extreme 40 co-designer Mitch Booth on the helm and representing the home crowd 33 South Racing with Katie Spithill and Stacey Jackson as the wild card entry, who will be put through their paces for the first time in the Extreme 40 fleet.